Fleet is a young Sceadu hunter: skilled, strong, and fast. She hunts deep into the icy mountains, seeking meat for her people, for the rains have failed and plunged the Sceaudu into hunger. Her hunts are hard, but she has much to look forward to. Soon she will be gifted her air-name by the Sceadu’s shaman, and then she will be a full adult, and free to marry the man she loves. But while Fleet is on hunt, the old shaman dies, and the new shaman visions a very different future for her: cross the frozen, ice-locked mountains and complete a perilous quest or lose the man she loves forever. In a moment of anger and frustration, Fleet commits a terrible wrong and sets out into the frigid mountains to atone with her life. In a journey that takes her deep into the earth’s darkest places, into strange new worlds, and even into Death itself, she discovers that only she can save her people. To survive, she must draw on every shred of her hunter strength, and doing the impossible, it turns out, is just the beginning. 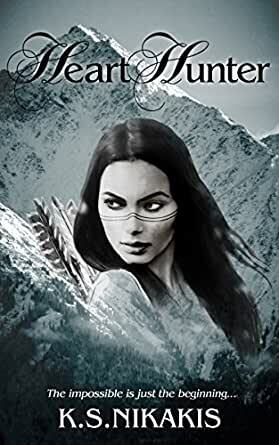 If you love strong, independent female hunters, bright snowy landscapes, worlds where truth might lie in the mystical realms of a vision-quest, and a dash of romance, you will love Heart Hunter. Buy Heart Hunter today to share Fleet’s danger, joy, and discoveries in her quest to save her people and the man she loves. I liked the beginning and the story. Unfortunately the lack of editing made it almost impossible, however painful, to read. Sack your editor. Am a little hesitant to purchase any more books. Karen Nikakis has a gift for transporting her readers into wonderful new worlds. Heart Hunter is a tale of strength, courage and growth for Fleet as she journeys to save her people. An easy and enjoyable read.